If you are using Hotot as your microblogging client of choice, you'll be pleased to learn that this nifty tool is now available as a Google Chrome app. 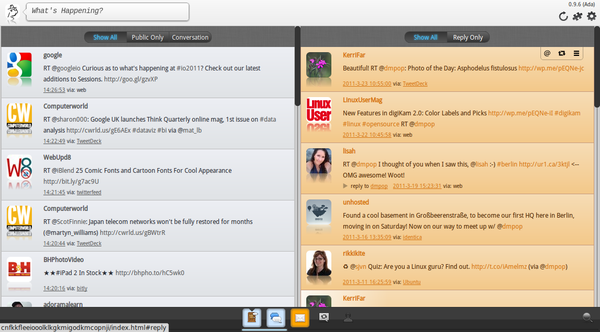 The new version of Hotot works equally well with the Google Chrome and Chromium browsers. One immediate advantage of using Hotot for Chrome is the ease of installation: you can install the app from the Google Web Store with a single click -- no need to fiddle with repositories or compile the application from source. Better yet, thanks to Chrome's ability to sync extensions and apps, you only need to install Hotot once to add it to other Chrome or Chromium instances. Hotot for Chrome looks and behaves almost exactly as its desktop version: the browser app even sports the adaptive interface feature which adjusts the number of columns depending on the width of the browser window. Hotot for Chrome also supports notifications and extensions, and the app sports a few clever modules, including the Translate extension which translates status updates on-the-fly, Instapaper which saves statuses to your Instapaper account, and GMap which displays geotagged statuses using the Google Maps service. All in all, if you use Google Chrome or Chromium as your primary browser and Hotot as your preferred microblogging client, you can combine both in one neat solution.